The editors of Everyday Food magazine have put together a great issue devoted to smart savings at the grocery store. What they have also done, wittingly or not, is given modern-day credence to some time-tested philosophies that have proven successful to generations past. I outline a few of them below. I'll never forget how thrifty my grandmother was at the grocery store, a characteristic she no doubt learned from her mother in wartime England. (When you survive financial hardship, it's hard to be lax about money.) She would not only clip coupons and watch for weekly savings in the flyers, she would also calculate, almost to the cent, how much she would spend each week on meals. 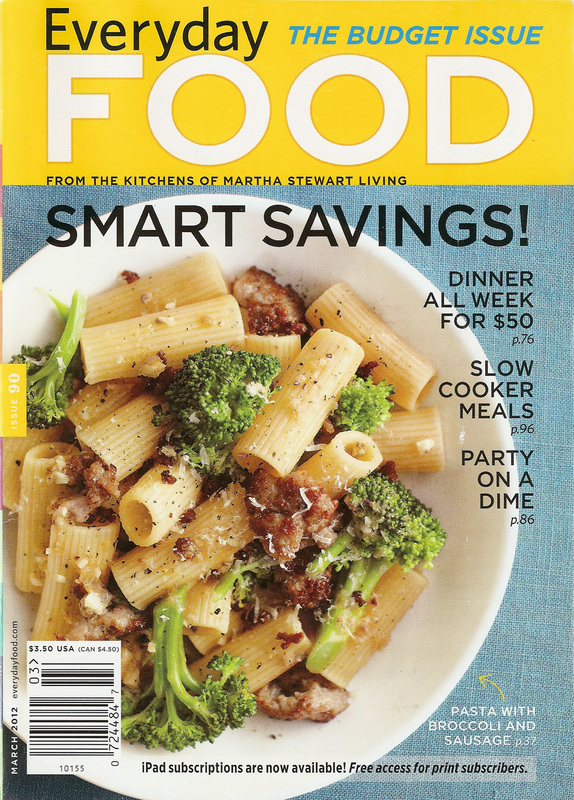 The March issue of Everyday Food is the perfect refresher course on how to eat great food without breaking the bank. While the issue is packed with money-saving tips and ideas, I've selected four 'financial lessons' that really ought to be kept in mind when it comes to meal planning. 1. Think you can plan five weeknight dinners on just $50? I didn't either until I read this article. The editors broke out their calculators and came up with five really good dinner menus that do not sacrifice taste, nutrition or facility. They also provide a carefully planned grocery list to help it all come together. Among the savory selections: vegetable frittata with roasted potatoes and garlic, creamy pasta shells with tuna and spinach and chili-braised pork with green beans and mashed sweet potatoes. It can be done, folks! 2. Buy seasonal fruits and vegetables and look for those that are among the most inexpensive. Bananas cost just pennies a pound and their sweet flavour goes a long way to enhance desserts. They are also great additions to cereal and yogurt and are sometimes the perfect snack on their own. The editors showcase this humble and versatile tropical fruit in a myriad of delicious desserts, from ice creams to cakes to tarts. 3. Another old-fashioned idea that makes good financial sense: gather friends and family and eat in large groups, with each participant contributing something to the table. The modern-day term is 'pot-luck' but it's an idea that dates back centuries. Not only is it a great way to eat wonderful food and catch up with loved-ones, sharing also reduces your spending. Make it a part of your regular routine. 4. Slow cookers are ideal for budget cooking since you can make large batches of one dish (storing plenty of left-overs in the freezer) with just a few well-chosen ingredients. Even better: the work is done for you with just the push of a button! a) Before a big grocery shop, check your supermarket's circulars (many of them are posted online) and plan your meals around the biggest bargains. b) The age-old advice still holds true: don't shop when you're hungry! You will end up piling on things you are craving at the moment but did not plan to buy. Make a list first and stick to it. c) Packaged and convenience products are often more expensive than fresh or whole foods. Select one or two favourites and make sure they are worth it to you in time savings. d) Use bulk bins to your advantage. Items like grains, beans, nuts and baking ingredients can be measured out so that you are buying only what you need to buy. I have the issue but don't cook much from Everyday Food. One thing that I find hard in Canada is to 'eat cheap'. Grocery items are pretty expensive compare to when I visit grocery stores in the States. They can get away with $50 but if I want to offer fresh produce to my family that's not possible in Canada. Interesting point, Helene. I cook for two most of the time, so my grocery bills are very low, which is why I may not notice the Canadian price differences. uI have always been very partial to pre-2005 Martha Stewart, when I feel the brand was more gentile and quieter. It's hard for me to exactly describe, but the vibe then was more personal to me: when I would watch Martha Stewart Living on television (oh, I miss that show so much), I felt like I really learned so much about homemaking, cooking, crafting, and life in general. I never really gelled with the newer show (with the live audience) because it seemed to me the elements of life that were the focus of the Martha Stewart Living program (cooking, homekeeping, etc.) took a backseat to the celebrity guests and audience. With the taped segments, I felt as though Martha and I were having a conversation - perhaps even a lesson. I felt the same way with the magazine at the time. I have remained a faithful subscriber to Living since 1996, but have always viewed the off-shoot magazines like Everyday Food and Whole Living as the sort of cousins who try to cash in on the Stewart name, but never really capture the charm of MSL. I subscribe to all 3 magazines (MSL, EF, and WL) but usually recycle EF and WL without doing more than glancing at them. I said all of that to say this: Articles like this in Everyday Food are causing me to look again and perhaps rethink my opinion. The editorial changes at MLS have caused me to take a second look there as well. For such a long time, MSL had been so clear in its vision and presentation, and I felt that post-2005 the brand was scrambling to reshape its identity and the brand became chaotic and disjointed up until recently. I think Ms. Guzman has done a nice job in wrangling in and defining a vision within the pages of MSL. I am hoping these changes are lasting, or at the very least, consistent for longer than a year or two. Thank you again for this wonderful page: I learn much from you as well! Mary, what a thoughtful and insightful post. I tend to agree with you. 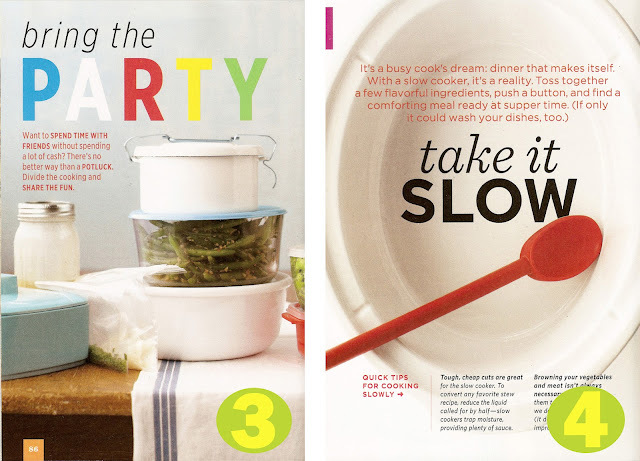 Martha Stewart Living magazine was at its peak (philosophically and artistically) in the early 2000s: wonderful editions were published that were extremely beautiful, helpful and inspiring, from page to page. It hit a rough patch when MS went to jail and I feel as if the editors were struggling to keep up with 'trends' instead of making them. I've loved Everyday Food from the beginning I guess because I can accept its mandate: cooking everyday with easy-to-find ingredients. It doesn't pretend to be anything else and it does its job well. 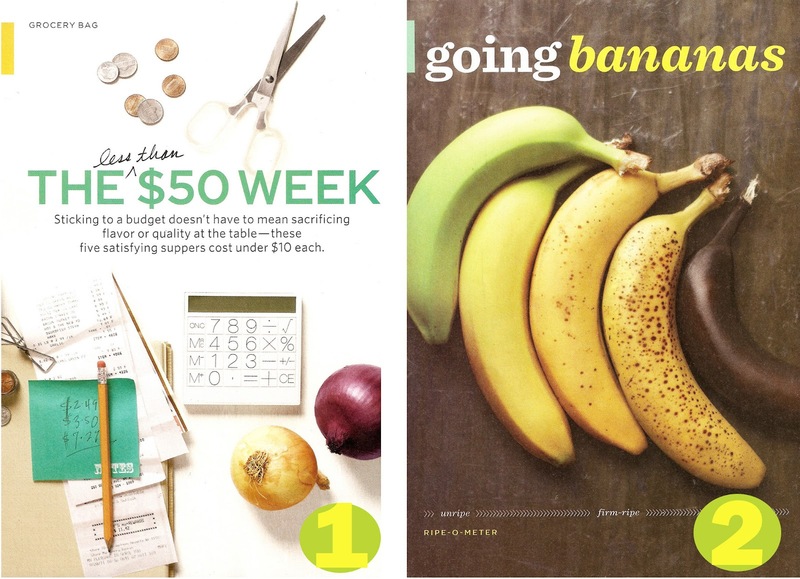 It's not meant to be a magazine we curl up with before bed (although it can be) it's meant to be used in the kitchen, stuffed into your bag when you go to the grocery store, even sliced up, with the tear-sheets going into your recipe box. I don't read Whole Living much although I do like the photography. Again, Mary, thanks for your thoughts! And thanks for reading!